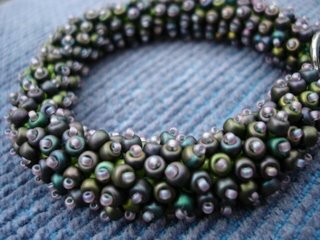 Have finished my bracelet this afternoon, the extra beads having arrived from the Bead Merchant this morning - excellent service. I particularly like the way the lime green twinkles through the darker beads which sit on top - nice design. Would make it again, but wouldn't say it's much beyond what I think of as mind-numbing beading - a little on the repetitive side.